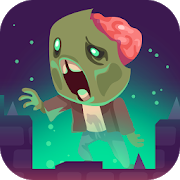 Hundreds of zombies are heading to your house in search of food. You must aim from the hill and kill them all. There's an awesome arsenal at your disposal! The zombies have invaded your planet again! Search your super arsenal and find something to finish them all. Don't let them take over your lands! Take your weapon and start hunting zombies there are many new weapons you can find. Use the arrow keys to move, press Z to shoot and load with X. Hundreds of zombies are coming closer and your only weapon is a gun. Shoot at their head to save some bullets. Press the space bar when it jams and R to reload it.